I have a soft spot for human powered vehicle (HPV) designs and normally stay away from making too much over concepts but this one has a lot of potential, although no one seems to have picked up on the design by Industrial Designer Austin Blough from 2012. The recumbent style seating is a natural propulsion configuration, but steering and control is a bit vague. 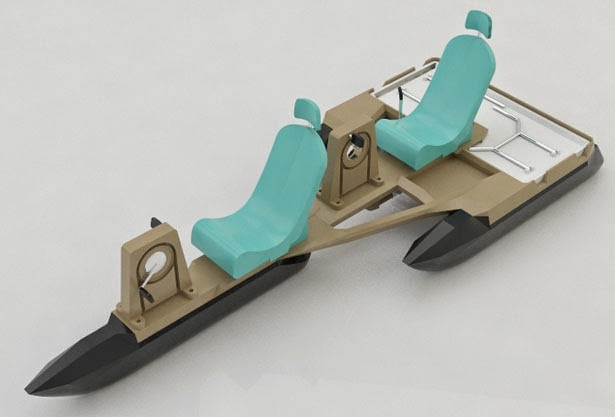 The idea of the front passenger paddling, as well as pedaling, is possible but not practical, being rather like patting your head while rubbing your stomach at the same time in difficulty. Arm supports on the front seat would do more for leveraging the peddling to improve propulsion. Austin's design is more focused on manufacturability rather than consumer product appeal but modest design changes could be made to improve this easily. For instance, the aft section could cater more toward storage and the rear seat swivel to face astern for fishing. Something like this could be a lot of fun on a Class I/II river if maneuverability issues could be worked out.